SysAid launched a brand-new user interface (UI) with a fresher and simpler user experience that will speed up your IT service delivery. - What are the new features and functionalities? - How will this help you reduce effort and time to resolution? Organizations continue to regularly switch ITSM solutions, every 3-6 years according to industry analysts. It’s an unfortunate, unwanted, and expensive technology-investment cycle that needs to be broken by organizations. Watch our webinar with renowned ITSM analyst, Stephen Mann, as he reveals what you should be focusing on in order to make the right ITSM-tool investment decision. Cybersecurity is fast becoming an ITSM challenge. Getting the upperhand takes understanding, resilience and the right tools. Oded Moshe, VP Product from SysAid, hosts expert guests, Stuart Rance (ITSM & security consultant) and Ian Bugeja (Director Product Management, GFI Software), to answer questions so you can start to increase your cyber defenses not only from external, perimeter threats but also from internal threats and unintentional exposures. 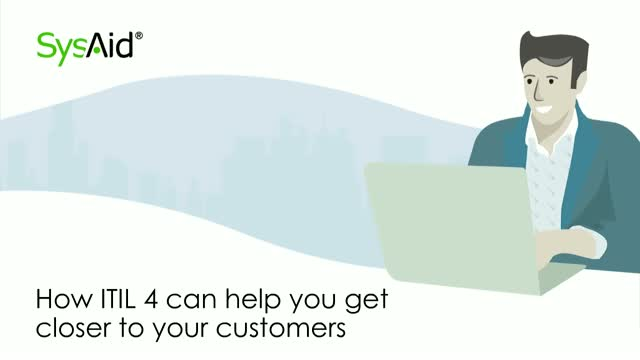 Allow your customers to control when and where they work with the benefit of 24/7 support. And since our self-service portal frees customers from the constraint of the support hours of a service desk — it also frees up your time! Find out what to expect when moving from on-premise to cloud. Este webinar les brinda una visita guiada a través de la solución de ITSM de SysAid, mostrándole cómo SysAid le puede ayudar en los desafíos a los que se enfrentan los profesionales de TI hoy día. Are you a manager in an IT team? Do you have the challenge of running multiple reports, giving quality data back to your colleagues and the rest of the senior managers in your organization? In this 5 minute video we will present you with the tool to deal with these challenges. Know you need a service catalog, but not ready for a full IT service management (ITSM) program? This webinar will present a practical approach to "reverse engineer" the core elements of a service catalog. ITSM practitioner Greg Sanker will explain how every organization has 'services' whether they know it or not. He will show how to identify your services and create plain-language service descriptions, which help create clarity and form the basis of a functional service catalog. Greg will show how to bypasses cultural resistance to the "we need a service catalog" approach, and actually create demand (and buy in) for a basic service catalog. Change management is a corporate necessity, however it can be very difficult for organizations to get it right. Part of the issue comes from organizations seeing change management as just another ITSM process – like configuration or capacity management, say – when change needs a much bigger perspective. These days changes are rarely, if ever, just about IT. Failing to understand the importance of change management can significantly hinder your organization. Join us for this webinar to ensure that your change management processes are working to benefit, not handicap, your business. Knowledge management, or more specifically knowledge exploitation, can make a significant contribution in improving an organization’s productivity and innovation. It’s particularly relevant and beneficial to the work of IT support analysts, who are often under pressure to quickly provide resolutions or answers – where from a business perspective, any delay by IT potentially costs money or adversely affects the company’s brand. However, while knowledge management has increased its profile within the IT service management (ITSM) industry in recent years, it’s sadly still one of the capabilities that many IT professionals know they need, but they can’t get the budget to support a related improvement program. A healthy knowledge culture, with knowledge management processes embedded into the day-to-day support workflow, will provide your IT support staff with vital knowledge when they need it, and the self-confidence to do their job well. Knowledge management can also lower stress and reduce the effort wasted on rework – it can ultimately feed a well-maintained self-service facility. Employee self-service is often viewed by IT as a 'knight in shining armor' since it can provide quicker employee access to both help and new services, while taking some of the pressure off overworked corporate IT service desks. However, for many organizations, their initial attempts to introduce self-service have been more white elephant than white knight – with low employee adoption and utilization rates – often due to an overemphasis on the technology. Too many organizations settle for resolution times and call numbers to measure their Service Desk performance. Learn how these are not only not enough, but may not be the right metrics at all! Incident management can be a very costly process, with lots of staff using expensive tools and telephony. It is also very visible to customers, who will let you know very quickly if it doesn’t meet their needs. So it’s really important to make sure this process is as efficient and effective as possible. This session will be based on Stuart’s many years of working with clients from a wide variety of industries and countries, many of whom have needed to implement improvements to incident management. Stuart will describe approaches that have worked for other organizations, which you may be able to adopt into your own improvement program. This webinar provides a guided tour through SysAid's ITSM solution, providing examples of how SysAid can help out with the challenges that IT professionals face today. Migrating to the Cloud is a large scale project that requires ITSM professionals like you to properly plan an overall strategy, design, operations and execution. This session will take you through 6 essential steps that will ensure a successful migration to Cloud, and will equip you with a workable plan to guide you through the process. Tune in to know as well the story of how SysAid successfully migrated our Email Services to the Cloud, and learned a lot on the way. Oded Moshe, VP Products at SysAid, has over 15 years of experience in various Product and IT Management positions. Oded manages relationships with OEM and technical partners around the world, and is the technical point of contact for all SysAid feature requests. Co-leading the design phases for new SysAid releases, he researches new technological innovations and integration methods, and reinforces the accessibility, simplicity, and spread of ITIL best practices throughout the SysAid product line. Watch dynamic discussions and learn from industry experts about IT service management (ITSM) and help desk hot topics, ITIL best practices, and SysAid’s features, including a powerful ticket management tool, IT asset management, self-service, BI analytics, mobile device management, chat, password reset, mobile apps, industry benchmarking, and more. SysAid Technologies Ltd. is a leading provider of customer-driven IT Service Management (ITSM) solutions. Available as a cloud-based or on-premise solution, SysAid provides affordable, innovative, and intuitive ITSM software aligned with industry best practices. SysAid serves over 10,000 customers across 140 countries, from SMBs to Fortune 500 corporations.